It was browsing through iww that my attention was caught by a quaint, unexpected word – Bhelpuri, which instantly triggered my curiosity to such an extent that I clicked on the designated link for a copy before I could say Jack. Next was the turn for another surprise when the book actually arrived couriered. The ever-famished foodie that I am, it was no surprise that I took to the cover jacket of the book instantly. A cornucopia of myriad dream joints - candle lit, rose tinted, flower bedecked - with a well garnished crystal bowl brimming with saliva churning bhelpuri sailed in front of my half closed eyes on winged vessel. The taste buds had hardly stopped salivating that the mindscape was tickled by twenty three short stories which seemed sliced out of life itself – some burning with desire, some lively with hope, some enriched with lofty ideals and some flying on clouds swaythed with optimism and joy. Were there no tears, no wistfulness, no cry of anguish left in this world to brood over? Questioned my pessimistic heart. No! Strong and determined came the answer. Yes, where Bhelpuri is concerned there is no scope for pain, want and thirst. The anthology of short stories pulsate with promises of a rosy future and a happy journey of life surmounting the ills and adversities of life with joyous leaps and bounds. That is why the taste of Bhelpuri is so long lasting. As nine women writers pool in their writing skills, strength of mind, varied experiences, positive vibes, wishful thinking and universal message of love, bonding, care, tenderness, will to survive amidst agony and angst, fraternity and friendship, Bhelpuri is reborn in a brighter hue and tangier taste. Bonded with ink, the Bangalore based Inklink Group of writers bring new colours of thoughts and theme to the literary world. A bow of gratitude to the Songbyrde Publications, Bangalore who has come forward to publish this unique collection of short stories for the new generation of readers. The book brings in a flavour of timelessness for all age groups. 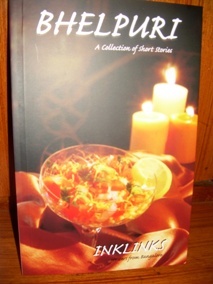 No wonder the caption of the anthology – “Bhelpuri” – a confluence of different fragrances of life itself - from pain to pleasure, from dejection to elevation, from desertion to reunion from despair to hope and from sorrow to salvation – it has all the aspects of life bunched into one bouquet of blossoms. Comments for A Short Review of “Bhelpuri"
Thanks you Sneha. I enjoyed reading the book too! Yes, I know. The book is an interesting mix and an amalgamation of varied talents...One of them being our very own Lakshmi Menon. The book of course because it came first...and then the review! I really can't decide which is greater, Geeta- the book or your review !